Eula Beal was an American contralto who spent most of her short (ten year) career on the concert circuit. She is most famous for her performance in a short film called "Concert Magic", where she sang with musicians including Yehudi Menuhin. She also performed Mahler's Eighth Symphony and Kindertotenlieder, plus the roles of Erda and the Innkeeper. 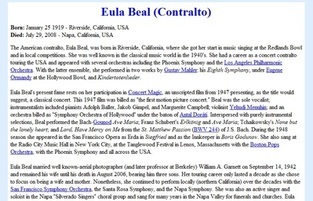 Eula Beal (January 25, 1919 – July 29, 2008) was an American contralto. During her relatively short touring career, she performed with distinguished collaborators not only in concert on the US West Coast but also in Concert Magic, a 1947 film billed as "the first motion picture concert." Beal was born in Riverside, California. Touring the United States as a concert contralto in the 1940s, she appeared with orchestras including the Phoenix Symphony and the Los Angeles Philharmonic. With the latter ensemble, she performed in two works by Gustav Mahler: his Eighth Symphony, under Eugene Ormandy at the Hollywood Bowl, and Kindertotenlieder. Beal's operatic appearances included impersonations of Erda in Wagner's Siegfried and the innkeeper in Boris Godunov with the San Francisco Opera during the 1948 season. She also sang at Radio City Music Hall and the Tanglewood Festival with the Boston Pops. Beal's present fame rests on her participation in Concert Magic, an unscripted film presenting, as the title would suggest, a classical concert. 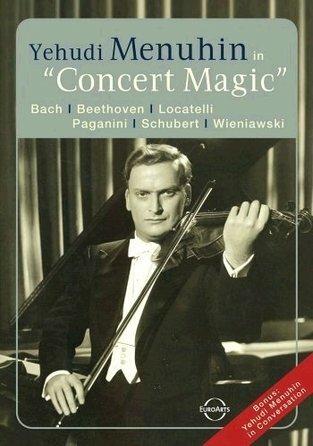 Beal was the sole vocalist; instrumentalists included pianists Adolph Baller, Jakob Gimpel, and Marguerite Campbell; violinist Yehudi Menuhin; and an orchestra billed as "Symphony Orchestra of Hollywood" under the baton of Antal Dorati. Interspersed with purely instrumental selections, Beal performed the Bach-Gounod "Ave Maria"; Franz Schubert's "Erlkönig" and "Ave Maria"; Tchaikovsky's "None but the lonely heart"; and "Lord, Have Mercy on Me" from the St. Matthew Passion of Johann Sebastian Bach. Beal married well known-aerial photographer William Garnett in 1941 and remained his wife until his death in 2006, bearing him three sons. After but a decade on the concert circuit, she opted to abandon her full-time performing career to devoting her time to her family. Nonetheless, she remained sporadically active in northern California, where she and Garnett made their home; besides providing music at local funerals and churches, she performed with the San Francisco Symphony, the Santa Rosa Symphony, the Napa Symphony, and a local Napa, California choral group. She died in Napa in 2008. This article uses material from the Wikipedia article "Eula Beal", which is released under the Creative Commons Attribution-Share-Alike License 3.0.